I made this bag. 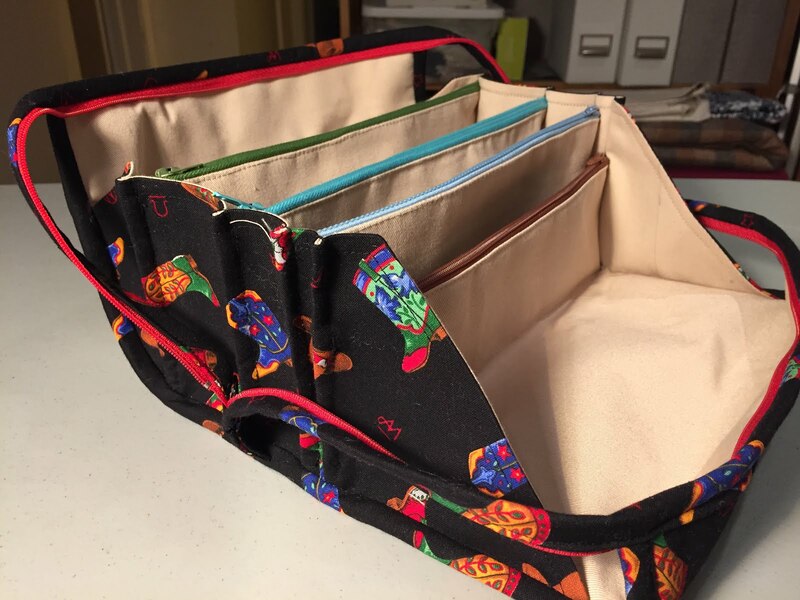 It's the "Bionic Gear Bag" (pattern available on Craftsy). I cannot remember where I first saw mention of the bag, but it looked super practical. 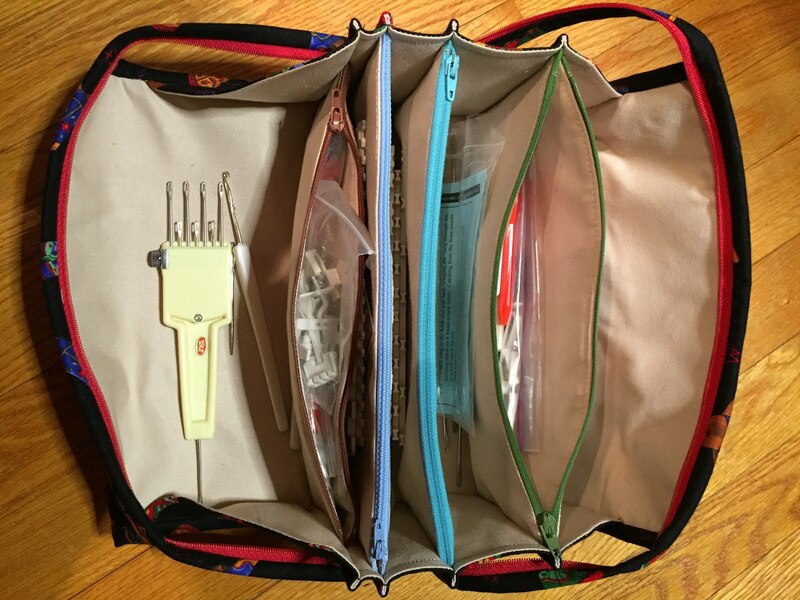 As I accumulate stuff, and especially stuff for my growing collection of knitting machines, I could really see the benefit of being able to put all the tools and little bits for all my machines into one bag that would allow them to stay organized yet be easily accessible. 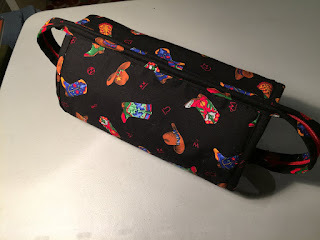 As usual, the stash coughed up every bit of fabric, interfacing, batting and the zippers needed to put this together. 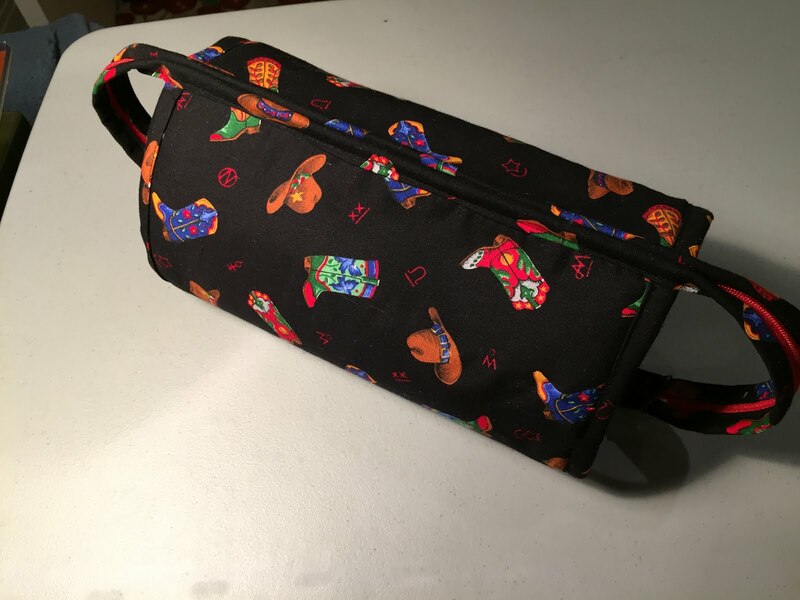 I made it from quilting cotton on the outside and a mystery light twill fabric for the inside pockets. I can't see the advantage of a busy interior for a bag that's being used to store lots of small items. Neutral seemed better, although some of the fabric combinations possible with quilting cottons are pretty cute. I chose some random zippers from my extensive collection. So the bag is terrific. As advertised, when unzipped it stands up very nicely all by itself with its "tray" at the front for the stuff you need at the moment. 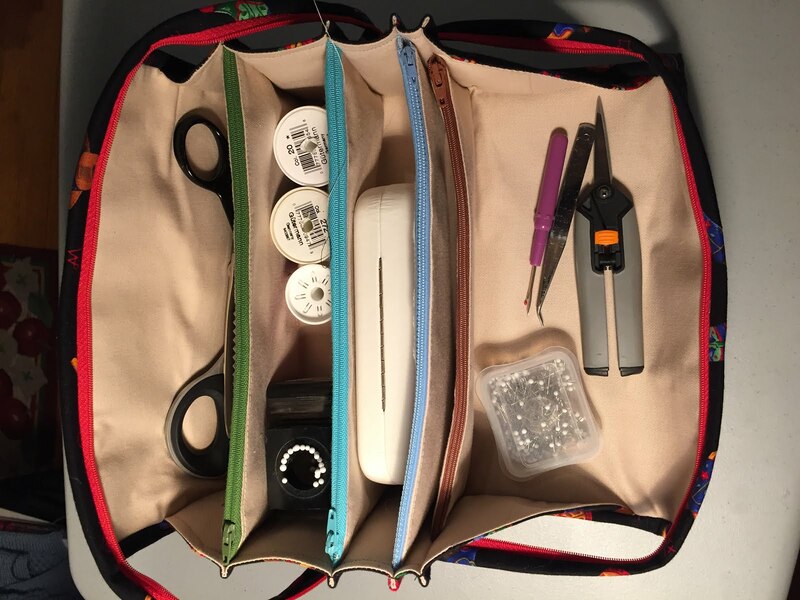 The pockets (4 zippered pockets and 4 open compartments of different sizes) don't flop closed and are also very easy to access. When you zip it closed, everything is nice and compact and secure. There is no need to be worried about things falling out or getting out of their compartments, even if the bag gets turned upside down. It's big enough (approximately 10" or 25cm side to side and 4.5" or 11cm deep) to hold all kinds of things (like my Kai shears or all the rulers and scale sets from my knitting machines). It is sturdy enough to hold substantial items. Downloaded PDF patterns by indie designers are a great idea but they require no expertise in pattern writing, and no discipline re keeping the document short yet complete. This PDF has 82 pages! It isn't a pattern, it's a novella. In fairness "only" 37 of these pages relate to the bag shown in my photos. The other 45 (!) are devoted to the task of explaining how to construct a little zippered pouch. I haven't yet managed to work up the psychic energy to assess how a little zippered pouch could possibly be such a complicated project. There is one (1) page out of the 37 that describes the pieces and materials, and one (1) page that has an actual pattern piece on it, which you can photocopy and use. The rest of the document contains pages with many words that fail miserably, in my opinion, to accurately and completely describe the task at hand, and a number of photographs that are not all that clear (busy fabric, awkwardly cropped/posed and unlabelled) so do not actually help all that much. There is not a single drawing of this bag in the 37 pages. Not a single schematic, cross section or other graphic that would allow you to avoid reading the many many many pages of many many many words. Nothing to give you an actual overview, either of the thing you are making or of the document. And so much extraneous verbiage is on offer! I absolutely do not need to know about the designer's pet peeves or favourite sewing notions. I don't want to be asked if I am "gettin' excited yet" after I complete a sewing task. Personally, I never do it. (Oh, did I say that out loud?!?!) But that said, while working on the "fox" themed example for this one, omg, I wish I had. It shrunk terribly when I just misted it to press it. I watched it shrivel before my very eyes. Note to self: maybe stay away from this brand of cotton in the future! I am not the first person to point out that this pattern is (to put it mildly) not well written. In fact it's so bad that someone (not the designer) posted YouTube videos "translating" the pattern so it can be understood. There are some videos on the designer's website but they are not helpful. Like the pattern, they contain too much detail (how to find the centre of a piece by folding it in half and placing a pin - wow), and not enough actual information. If, unlike me, you don't mind watching about 2 hours of video so you can work out how to make the thing you bought a pattern for, go ahead. Here's the link to Part I of the Sewalong. 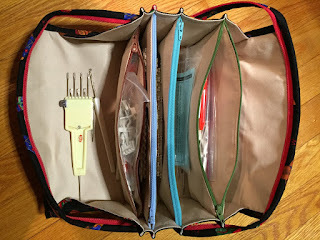 I watched enough of it so I could understand the gist of what I was supposed to be doing in putting together the pieces for the innards of the bag (the zipper pockets and compartments assembly). After that I was able to wing it with occasional searches of the PDF. In short this pattern caused considerable frustration. But I love the finished bag. I may even make another one.